For the 2015 Telugu film, see Rudhramadevi (film). 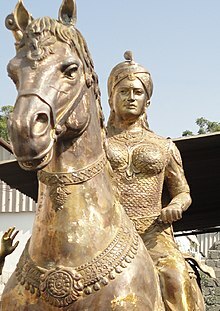 Rani Rudrama Devi (died 1289 or 1295), or Rudradeva Maharaja, sometimes spelled Rudramadevi or Rudrama-devi, was a monarch of the Kakatiya dynasty in the Deccan Plateau with capital at Warangal of present day Telangana from 1263 until her death. She was one of the few women to rule as monarch in the Indian subcontinent and promoted a male image in order to do so. Rudrama Devi probably began her rule of the Kakatiya kingdom jointly with her father, Ganapatideva, as his co-regent, from 1261-62. She assumed full sovereignty in 1263. Unlike her Kakatiya predecessors, she chose to recruit as warriors many people who were not aristocratic, granting them rights over land tax revenue in return for their support. This was a significant change and one that was followed by her successor and also by the later Vijayanagara Empire. Rudrama Devi faced challenges from the Eastern Ganga dynasty and the Yadavas soon after beginning her rule. She was able to repel the former, who retreated beyond the Godavari River in the late 1270s, and she also defeated the Yadavas, who were forced to cede territory in western Andhra. A fragmentary Kannada language inscription also states that the Kakatiya general Bhairava defeated the Yadava army probably in or after 1263 CE, which may be a reference to his repulsion of Mahadeva's invasion. A coin of Mahadeva bears the Kakatiya emblem varaha with the Yadava symbols; this varaha may have been stuck on Mahadeva's coins to mark the Kakatiya victory. She was, however, unsuccessful in dealing with the internal dissent posed by the Kayastha chieftain Ambadeva after he became head of his line in 1273. Ambadeva objected to being subordinate to the Kakatiyas and he gained control of much of southwestern Andhra and what is now Guntur District. Inscription on the death of Rani Rudrama Devi in Chandupatla, 1289 CE. Rudrama Devi married Virabhadra, a member of a minor branch of the Chalukya dynasty, probably in 1240. This was almost certainly a political marriage designed by her father to forge alliances. Virabhadra is virtually undocumented and played no part in her administration. The couple had two daughters. Rudrama Devi may have died in 1289 while fighting Ambadeva, although some sources say she did not die until 1295. [a] She was succeeded by Prataparudra, a son of one of her daughters, who inherited a kingdom that was smaller than it had been when Rudrama Devi had ascended her throne. Film maker Gunasekhar made a Telugu film Rudhramadevi on the life of Rudrama Devi with Anushka Shetty, Allu Arjun, Rana Daggubati and Krishnam Raju in the lead roles. ^ One ancient inscription discovered in 1994 suggests that Rudrama Devi died in battle at Chandupatla village on 27 November 1289 but more recent reliable sources make no mention of this and some sources claim she died in 1295. Two sculpture discovered in 2017 may possibly confirm the 1289 location and date. ^ Ramusack, Barbara N.; Sievers, Sharon L. (1999). Women in Asia: Restoring Women to History. Indiana University Press. p. 37. ISBN 978-0-25321-267-2. ^ a b Talbot, Cynthia (2001). Precolonial India in Practice: Society, Region, and Identity in Medieval Andhra. Oxford University Press. p. 273. ISBN 978-0-19513-661-6. ^ Talbot, Cynthia (2001). Precolonial India in Practice: Society, Region, and Identity in Medieval Andhra. Oxford University Press. p. 158. ISBN 978-0-19513-661-6. ^ a b c Smith, Bonnie G. (2008). The Oxford Encyclopedia of Women in World History. 1. Oxford University Press, USA. p. 612. ISBN 978-0-19514-890-9. ^ T. V., Mahalingam (1957). Seuna-Kakatiya. p. 150. ^ Talbot, Cynthia (2001). Precolonial India in Practice: Society, Region, and Identity in Medieval Andhra. Oxford University Press. pp. 133–134. ISBN 978-0-19513-661-6. ^ Talbot, Cynthia (2001). Precolonial India in Practice: Society, Region, and Identity in Medieval Andhra. Oxford University Press. pp. 155–156. ISBN 978-0-19513-661-6. ^ Reddy, T. Karnakar (20 November 2014). "Govt urged to observe death anniversary of Rani Rudrama Devi". The Hindu. Retrieved 18 August 2016. ^ Venkateshwarlu, K. (5 December 2017). "Two sculptures of Rani Rudrama Devi shed light on her death". The Hindu. Retrieved 20 January 2018. ^ "Anushka to do a Tamil-Telugu period film?". Times of India. 6 October 2012. Retrieved 24 November 2012. Wikimedia Commons has media related to Rudrama Devi.